NOTE: This is part of the Night of Blessing series. 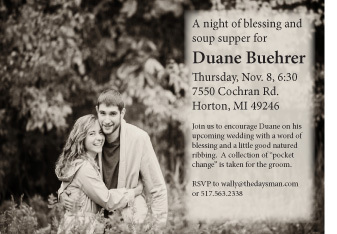 It was a charge for Duane Buehrer when 55 men from our church met to encourage and challenge him for his wedding December 1. In Biblical times, after his family had negotiated the terms of a dowry, a young man left to prepare a home for his bride. When everything was ready he returned to claim her—often unannounced. The 24/7 cycle of today’s engagements would have seemed odd to them. And unwise. Because although he was committed to her, he didn’t see her much. Betrothal then was as legally binding as marriage itself, but he waited to be with her. And she anticipated his arrival with patience and joy, uncertain of when he would arrive. It is such a different day in which we live. Fidelity is almost quaint, a standard few understand and fewer practice. But I want to say, as an elder and friend, that I appreciate your respect for this very biblical responsibility. Few men today would sit outside on the porch, even in cold weather, as you have with Abby several times when no one was home. In some ways, you too have waited and prepared. It has not been easy to wait. It never is. But you have shown yourself to be circumspect in this regard, and before these men I commend you for your character and virtue. I also commend the discipline your have displayed in preparing for this day, working hard, saving money, asking questions. This too is uncommon. But you have planned for this wedding, even before you knew this woman. Since Abby has been living with us, I can assure you her excitement and anticipation is equal to any New Testament bride. And although she does know the time and day, she has wanted to be married long before she wanted to be married to you. But she wants to be married to you now. And since she has been in our home two years, let me say this. She has a tender heart, open to correction and instruction, and she will honor you and respond to your leadership. You both have much to learn, of course. But I have seldom encountered an engaged couple as willing to learn or less resistant to correction. Your own willingness to seek counsel sets you above many of your peers. You have great potential to lead, both in your home and in our church, because you have a willingness to be led. What I have seen is that you cherish this woman. What I have seen is that you are willing to point her toward Christ and his Word. What I have seen is that your love is sacrificial and stable. I’m confident you are ready to do this, and do it well. So I only remind you of what you already know—that yours is a sanctifying work, one that will help present your bride before God more thoughtful, more gracious and more holy than when you receive her, even though she is already all of these things. And I remind you that your life together will be, and should be, a picture of how Christ loves the church. People will look at the two of you and understand something of God’s covenant keeping love to His people. When that young Jewish man arrived to claim his bride, he took her home. The ceremony began with the Cup of Joy, a glass of wine shared by the bride and groom. Under a tent that signified the home he had prepared, the bride circled him seven times and then he covered her with a shawl that represented his protection. You have prepared a home for Abby in a sense, or at least the security that represents. You will soon pledge to protect her and cherish her as long as you both shall live. And you have prepared the bridal chamber, or at least you made reservations in a nice hotel. Back then the ceremony ended with another glass of wine, called the Cup of Sacrifice, a significant reminder of the blood by which covenants are sealed, much like our own Covenant with Christ is signified by the Lord’s table. Then the groom placed the glass on the floor, covered it with a cloth and smashed it with his foot, each chard of broken glass representing the varied and unique experiences, trials, and events the future would bring. You will have these unique experiences, and some of them will be sorrows. They will not outnumber the joys. Have a told you that I absolutely love this blog? I’m super excited you put this up here! I don’t know if this little box will allow me a sufficient comment to express how much I am blessed through this blessing for Duane. Thank you so much for being there for me and for saying the hard things when needed. God knew I needed you and Katie.